The secret is out, product recommendations are a great way to engage with customers and produce conversions. In the competitive online market space, however, the question is always how to make the most of your investment in such a tool. 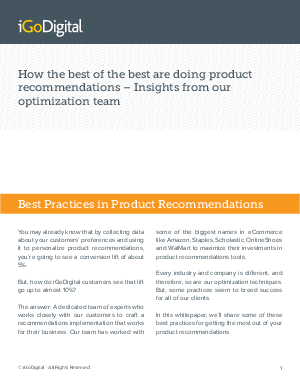 Using the insights that our optimization team has gained in working with the top online retailers and brands, discover how to take your 5% conversion lift to nearly 10% by implementing a best practice approach.